NOTE: For more information on the revised Dauphin County Comprehensive Plan and the public review and comment period, please jump to the comp plan section below. The mission of the Dauphin County Planning Commission is to guide, coordinate and promote the wise and orderly use of land and resources in order to facilitate the growth of the local economy, enhance the quality of life and preserve the natural environment by meeting the needs of the County’s present population without compromising the needs of future generations. The Dauphin County Planning Commission functions to fulfill the obligations under the Pennsylvania Municipalities Planning Code (MPC). New photo pending. Commissioners' term expiration in parentheses. 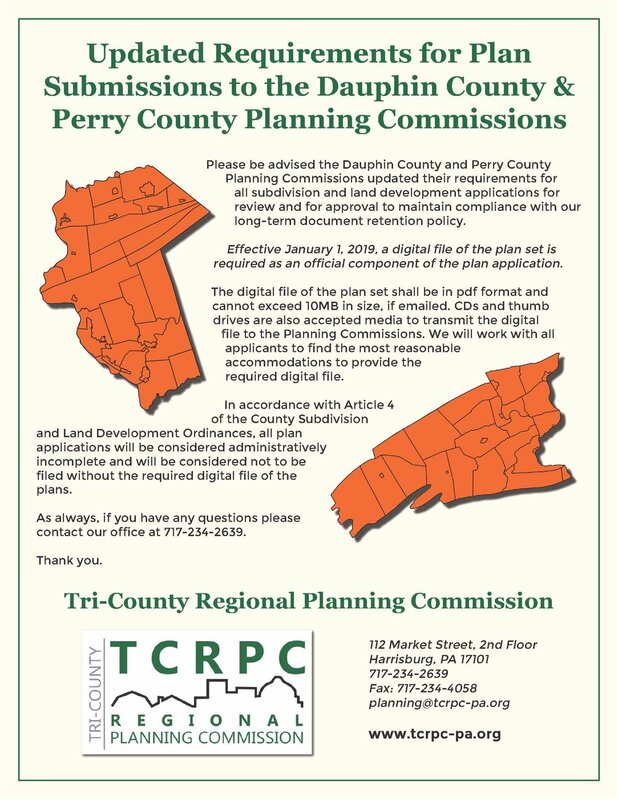 Dauphin County Planning Commission Meetings are held at 4 p.m. on the first Monday of each month (except for holidays) in TCRPC's 2nd floor conference room, 112 Market St., Harrisburg, PA 17101. Called “Growing Together,” the plan is the culmination of an extensive effort over the past year to coordinate with residents, public officials and a variety of organizations to develop a comprehensive, forward-looking plan. This plan is the first county comprehensive plan in the state to have a dedicated website to invite public input and broaden awareness. Dauphin County is also the first county to use the state Department of Community and Economic Development’s “Implementable Comprehensive Plan” approach to develop a user-friendly, action-oriented process for accomplishing goals. Plans will not be accepted without the required fees and a completed application, including signatures from the respective municipality. Article 10 - Enforcement, Amendments, Violations, etc. This annual awards program acknowledges and encourages planning excellence in Dauphin County, recognizing projects that meet the community, environmental and economic goals of the county’s recently adopted Comprehensive Plan. Individuals, organizations, municipalities, public authorities, developers and public/private partnerships may submit applications for plans, studies and projects completed in Dauphin County in which they were principally involved in design, development or implementation. Awardees and their teams are honored during an annual luncheon. For more information, visit our Premier Project Awards page.